In the war-weary year of 1940, just one rundown hospital survives London's collapse. Sister Barbara, a nun and volunteer nurse, inspires hope in her patients, but that faith is shaken when an unidentified aircraft explodes near the hospital. The half-eaten corpse beneath the mangled wreckage appears to corroborate the pilot's story that some sort of "tentacle-monster" attacked his plane. However, Sister Barbara pushes these dangers aside and plunges beyond the rubble when the man she loves disappears in the wastelands. She discovers a bloodstained beauty in his place—but the girl's outward innocence hides a voracious sexual appetite, and an even more disturbing secret. One by one, the terrified patients vanish from their beds. Titillating tentacles lick the hospital walls at night. And the dreams, always the dreams, drawing Sister Barbara deeper into a well of madness. She suspects she and the other women at the hospital are transforming into something... unholy. Sister Barbara knows she must figure out what before the evil in their midst consumes them all. Vicy Cross can tell a story. Her words collide together and string out pure prose writing that makes you want to read again. "In my dream, Mrs. Tuttle played the pipe organ in the cathedral. Her fingers assaulted the keys until the ivory was stained with blood . . . I remember Mrs. Tuttle's crazed smile even as her fingers turned to pulp on the keys." 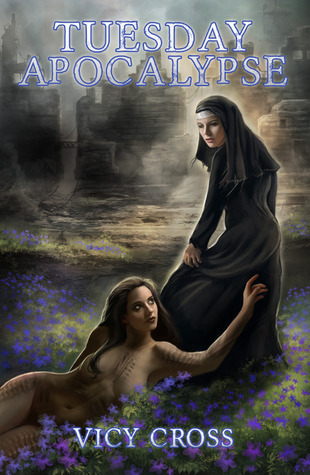 Tuesday Apocalypse is a romance erotica and a historical masterpiece with a Lovecraft-ian touch of a parasite tentacle monster. "The haze billowed toward me, laughing somehow. It was a woman's laughter, and her voice sounded cruel and sharp like shattered glass." I'm not going to give a huge description of the book. Read the synopsis and trust me this will be a book you will give you a memorable read. With Cross's likable characters and amazing writing. "I saw the tongues of hell in Tuesday's smile. Black smoke licked the street, and yet her eyes sliced through the darkness like two neon torches. The expression she gave me will scar my memory forever." Also check out my status updates for more quotes from the book! Historic erotica - probably not quite my thing. But cool there's a touch of Lovecraft in the story.